Darwin's God: Who Was Alfred Russel Wallace? 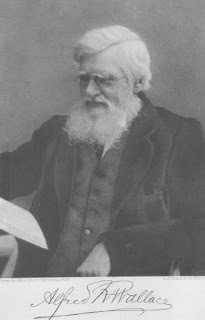 Go here to find out who Alfred Russel Wallace was. Or better yet, buy the book. For Michael Flannery’s biography is the most important new book I have read in years. The immense attention focused on Charles Darwin by evolution historians has unfortunately overshadowed Wallace, whose life was arguably more fascinating and insightful. Unfortunately views that are offered on Wallace today are often from Darwinist perspectives. Flannery remedies this imbalance with his story of Alfred Wallace that brings an entirely new light to the theory of evolution. In this corrective against the familiar but erroneous casting of Wallace as a miniature Darwin, Flannery artfully brings out the stark contrast—even down to their final works—between the evolution co-founders. But Flannery’s biography is not merely a look back. Like any good history, Flannery’s tells us something about where we are, and how we got here. From their early years onward, Wallace and Darwin existed in different worlds. Their paths intersected at evolution, but they approached and departed that intersection with many different perspectives. Flannery provides a broader context than is usually found in such histories and in convincing detail demonstrates the influences and connections to today’s discussion. Neither idolizing Wallace nor minimizing Darwin, Flannery provides a much needed balanced view that leaves us with a richer understanding of our ideas on origins.